Here are transcripts from The Scranton Tribune of a criminal trial that occurred in Tunkhannock in April, 1895. A man from Nicholson named G. or C. Washing Waterman was killed and several men were arrested and put on trial for the murder and/or for being accomplices. The story involves lots of drinking, a questionable detective, corruption, and nepotism; and that’s only from the newspaper! The author of the articles is only identified by his initials: V. H. L. The transcripts are taken directly from the digital editions of the newspaper at The Scranton tribune. (Scranton, Pa.), Chronicling America: Historic American Newspapers. Lib. of Congress. When errors or typos are obvious in the original, I’ve use (sic) to indicate them. Otherwise, typos are mine. Comments or corrections are in [brackets]. Bert PRATT, the man who was arrested for complicity in the murder of G. W. WATERMAN, was given a hearing before Esquire KUTZ Saturday afternoon. The principal witness against his was Miss Nina SHOOK, who was waiter girl at the Stevens House at the time of the alleged murder. PRATT and Irvin WESCOTT ate supper there, and Miss SHOOOK testified to hearing a conversation between them at the supper table in which PRATT offered WESCOTT first a handful of silver and a roll of bills if he would see to it that WATERMAN was not alowed (sic) to testify at a case in court the next day in which the former was interested. She also clained to have heard PRATT say next day, after the tragedy had occurred, that “if they arrest us they won’t find anything about us, even a knife.” The defendant was sent back to jail. Detective W. H. RICHMOND was brought before Esquire KUTZ for a hearing yesterday on charge of impersonating a detective, preferred by Bert PRATT, one of the defendants in the WATERMAN murder case. He was dismissed, but held to bail on charge of arresting I. E. WESCOTT (sic) without authority. He also gave bail to appear at court in answer to prosecution for surety of the peace by Lon WALL. The latter had previously been prosecuted by RICHMOND on the same charge, and was held to bail. In the case of the commonwealth against Fred WALL, Bert PRATT and I. E. WESCOTT, indicted for the murder of G. W. WATERMAN, the grand jury, after a long and tedious investigation, found true bills against Wall and Pratt, but not against Wescott. Every possible effort, seemingly, is being made to destroy confidence in and break down the reputation of the detective in the WATERMAN murder case by the friends of the indicted parties. The man came a stranger into the town, and may have said and done some unwise things, but he is endeavoring to hunt down and bring to justice the perpetrators of a horrible crime, and so far as he keeps within the pale of the law he is entitled to public sympathy. It is of utmost importance that murderers, thugs and robbers be hunted down, and all good citizens should lend every possible aid, let the criminals be whom they may. If the accused men in this case are innocent they doubtless will be able to prove their innocence; if they are guilty, let them suffer. Defending a man against false accusations is one thing; overriding justice in another. It is alleged that W. F. RICHMOND, the detective who has made himself somehwat notorious in connection with the WATERMAN murder case, has deserted his wife and child at Pittston and skipped to parts unknown, after spending nearly all the money inherited by her. She was Miss Addie ROGERS, a daughter of Henry ROGERS, of Centermoreland. The case of Fred WALL charged with the murder of G. W. WATERMAN, was brought before the court yesterday afternoon and the defendant, on being arraigned, plead “not guilty.” Then began the long and tedious job of impaneling the jury. One after another the jurymen were set aside until 5:15 o’clock, when George W. BOND, a miller for Gregory & Overfield, at Meshoppen, was sworn. He was alone in the box when court closed for the night. The impaneling of the jury in the WATERMAN murder case was concluded at 3:10 yesterday afternoon, the list being as follows: Cyrus L. STEPHENS, George W. BOND, Fred JAQUES (sic), E. D. ROBINSON, Addison E. MOWRY, George SMITH, Ira WINTERS, Draper SMITH, Ruel BAKER, D. A. KNUPPENBERG, Corey WALTERS, Charles F. HAHN. The attorney for the commonwealth took up the case and William and Henry WATERMAN, WESCOTT, and Thomas HARDING were sworn. 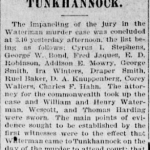 The main points of evidence sought to be established by the first witnesses were to the effect that WATERMAN came to Tunkhannock on the day of the murder to attend court; that he put up at the Wyoming house, and that late in the evening he was found dead in the alleyway near the Gearhart coal pockets under circumstances that strongly pointed to murder. HARDING, who is proprietor of the Wyoming house, testified that WATERMAN put up at his house; that he became visibly intoxicated during the day, and that early in the evening he left the house still in the same condition; that Bert PRATT and WESCOTT became apparently alarmed for his safety when he did not return at bedtime and started out to hunt him up. About 10:30 they came in and announced that they had found him out in the alley and he was dead. HARDING took an engineer’s torch and went out to see about it, and without waiting to investigate whether the man was actually dead, ran to Dr. BIDLEMAN’s office and aroused him. The latter went over and examined the man and found him dead. HARDING testified as to the position of the body, which was lying with the head next to the stone embankment that supports the inclined railroad tracks leading up into the coal chutes, the feet stretched out into the roadway, the hat clasped between the legs. He also testified to a conversation with Fred WALL which occurred next day, in which Fred said: “I understand they say I had something to do with this murder?” “Yes,” replied HARDING, “I’ve heard it intimated that you might have had something to do with it.” “I don’t see why they should say such things as that; I didn’t have anything to do with him,” said WALL. “Well,” replied HARDING, “you was with Bert PRATT last evening, and they seem to think he had something to do with it, and so they suspicion you.” Asked by an attorney if WALL didn’t say that he could put his hand on the man that did it he replied that he wasn’t just sure whether he said that, but he thought he said he believed he knew who did it, but he couldn’t swear to it. The court room will probably be crowded today, as some of the most important witnesses are expected to be upon the stand. Proceedings of Fred Wall’s Trial, at Tunkhannock. Special to the Scranton Tribune. Tunkhannock, April 10.—The evidence in the WATERMAN murder trial, which was begun yesterday, was continued today before a large crowd of interested spectators. S. Judson STARK, who was one of the coroner’s jury, testified to examining the ground where the body was found and also the embankment to see if there were signs of anyone having fallen off the wall. He saw nothing to lead to such a belief. James W. PIATT, attorney for the defendant, suggested that the jury be taken to the spot where the body was found and allowed to examine the ground in order to better understand the testimony. A quibble immediately arose as to whether the defense intended to point out the location with the intent to produce upon the minds of the jurymen that the tragedy was merely the result of accident. It was finally settled by counsel on both sides agreeing not to make any explanations. Theodore STREETER, undertaker, testified to being called up in the night Jan. 9, 1894, and taken to the Gearhart coal chutes, where he found the body of WATERMAN. Described position. Found cut over left ear inch and a half long, skull cracked, and other wounds upon the head; blood issuing from nose and ear. Carried body to undertaking establishment. Washed body, found dirt in wounds. When body was found the would was not in contact with the ground or dirt. Examined ground on top of wall. It was loose filling and of such a nature that I think I could have discovered it if anyone had stepped upon it. Counsel for defendant questions: STREETER—The body was brought to my establishment about 12 o’clock. I examined clothing next morning. Do not know who or how many might have handled or examined clothing. I took clothing off. I examined it before I was first called before coroner’s jury and again afterward. Prosecution questions: Found blood on handkerchief around neck and on vest. Blood on pockets of vest, like finger marks. Didn’t examine clothing until body was taken to my store. Didn’t find any blood on front of clothing; reason why I examined particularly was because I heard them say he had the nose bleed. There was blood on the hat. The family of the deceased asked for the clothing and had it until the day of the funeral, when I brought it home. It has been in my possession ever since. There was dirt and gravel in the wound over the ear so that I had to stretch it apart in order to wash it out. Looked as if it had come in contact with the earth. The ear was torn, as if struck a blow. Saw no other bruises on the body. Vest was buttoned, but don’t think coat was. There was no money in pockets when I examined clothing. Wound over ear was dry, not bleeding. Judge the pool of blood where he was found came from the nose. I. E. WESCOTT recalled: I examined the body where it lay when found, in presence of Mr. KUTZ. Felt inside of pockets of vest, but found nothing; found some things in pants pockets—found pocketbook. Gave it to ‘Squire KUTZ. It was closed all in proper shape. Opened it after we got over to Tom HARDING’s; found $9.93 in it. Found a watch, also. It was fastened to a buttonhole in the vest by a string, or slipnoose. The bills in pocketbook were folded up nicely as though they had been there for some time. STREETER recalled—Brings vest taken from body and identifies as same also condition is same. Counsel for defendant object to admitting vest as evidence because it has not been in his continuous possession, and others, relatives of the deceased, had handled it. Objection sustained, but jury must judge for themselves the weight of evidence it should carry. Mrs. C. (sic) W. WATERMAN [Mary], widow of deceased, called and identified the clothing exhibited as the same worn by her husband when he left home the day of his death. Clothing admitted to evidence. Dr. J. W. DENISON—Helped make post mortem examination of body of C. W. WATERMAN March 9 1894. Found wound on left temple, ear torn down, and small puncture on top of head. In my opinion the wound on temple produced death. The upper edge of the wound was clean cut, the lower bruised, as though made with a blunt instrument. Think a person receiving such a blow would be rendered unconscious at once, and not able to walk. Saw pool of blood in front of Stevens’ house. Dr. DENISON still on the stand—The character of the wound on the temple was such that it could not bleed much—it was a contusion. The effect would be to paralyze the heart. Traced the drops of blood from the pool in front of the Stevens house diagonally across the street and down the sidewalk to perhaps a couple of rods below Heckman’s house, then back up to the Montrose railroad crossing and down the track to point nearly opposite where the body was found, but could not trace it under the trestling to where it had lain. I made the autopsy, assisted by Drs. BIDLEMAN, HILL and HELLER. Think DORNSIFE was there also. Found discoloration on back of neck, nose was scarified. Described condition of front of Stevens’ house; witness said he did not think WATERMAN received the fatal blow there. He could not have bled so much if he had. Pool looked as if the blood came from the nose. It is my opinion that he did not receive the puncture of the skull at the same time that he did the wound near the ear, neither were they made by the same instrument. W. E. KEIFER, O. S. MILLER, and M. A. BACON sworn, but no new facts elicited. They examined the ground and embankment, but found no marks to support the theory Waterman had fallen off. William GILROY—Was in the Stevens House on the night WATERMAN’s dead body was found. WATERMAN came there along about 9 o’clock. Staid (sic) there probably half an hour. Was intoxicated, took a drink while there. Fred WALL was there. He and another fellow claimed they had a drunken man in the barn and had to look after him. They went out and were gone probably half an hour. WATERMAN went out the front door about 9:30. Fred and his companion went out the front door also between 9:30 and 10. I left the house about 10:30. Don’t think WALL was intoxicated. Heard no noise or disturbance outside. Nelson LEHN—Was at the Stevens House on night of Jan. 8, 1894; went there about 9:30, after attending lodge. Do not think the street lamp in front of hotel was lighted. Fred WALL, PRATT and some companions were drinking over the bar inside. I saw WATERMAN after he was dead, lying near the coal chutes. I was at the Keeler House, and went down. Think it was about 11 o’clock. A. W. FELDMAN—Was at the the Stevens House on the night mentioned. Think the street lamp in front was not lighted. Charles HARDING—Was at the Stevens House at about 9:30 on night mentioned. Staid (sic) about fifteen minutes. Saw WATERMAN, but not Fred WALL. Went over to the Wyoming House, found Fred WALL and PRATT there. They wanted oysters, but Tom told them he hadn’t any. They had been drinking, but don’t think they were very drunk. They spoke about going back to Stevens’ House barn to look after PRATT’s brother, who was in the barn, drunk. They were afraid he would freeze to death. PRATT was at Steven’s (sic) House when I left, but he soon came over to the Wyoming House. Waterman had a red handkerchief hanging down in front of his vest; didn’t notice that he was bleeding. Jerome K. LORD, night clerk at Packer House—WATERMAN came into the Packer House about 9:30. He was considerably intoxicated. Wanted something to drink, but would not let him have anything. His nose was bleeding somewhat. He wanted to know if anybody had engaged board there for him. I told him “no.” Think he said he was going to the Stevens House. He was so drunk that it occasioned remarks from those in the room. Some of them watched, I think, to see if he got safely across the railroad tracks when he left. W. H. ROSENGRANT—was proprietor of the Warren street hotel at the time WATERMAN was found dead. Fred WALL came in about 9 o’clock on that night and again bout (sic) 9:30. Bert PRATT was with him. Both had been drinking. Jennie CASKEY—Kept a confectionery and oyster store on Warren street in January, 1894. On the night of Jan. 8 WALL and PRATT came in after oysters. WALL seemed uneasy, and went out several times. Said something about looking for somebody. They took their oysters stewed. Think they were there about three-quarters of an hour; left before 10 o’clock. Abram IDE—Live next door to Stevens house. On the afternoon of Jan. 8, 1894, was working for Dr. BIDLEMAN. Saw WATERMAN and other standing near Gearhart’s coal office. WATERMAN had some money and he and the others were talking in rather loud voice about the money. Fred WALL was standing a few feet away. Saw Fred and PRATT standing near my fence about supper time. Didn’t get the run of the conversation, but heard somebody say, “why don’t you hit the ———. The lamp in front of Stevens house was put out or went out between 9 and 10 o’clock. Late in the evening I went out to draw some water at the hydrant, and heard someone say “we must keep this awful still.” Another of the party said. “sh-h,” as if to keep him still. After going into the house saw a flash of light as if someone was lighting a match. Next morning saw blood on the walk and found coupling pin, which had book upon it, lying just back of where the men stood the night before. I went to the station to take the Montrose train to Lake Carey, where I was working. I first learned that a man had been killed while we were going up the mountain. Don’t know what became of the coupling pin, never saw it again. I next saw Fred WALL Thursday morning following. He had on a new pair of overalls and jerk shirt. I remarked that there must have been a fire. He explained it by saying that Sherm STEVENS had a sick horse and he got his clothes bloody, and could buy new ones as cheap as to get the old ones washed. Cross-examined—Did not mention any of these circumstanced to anybody, not even my wife, until I was called before the grand jury. Weaving the Net of Evidence About Fred Wall. Tunkhannock, April 11.—When court was called this morning Abram IDE again took the stand and the defense resumed the cross-examination. For two hours or more the witness underwent a terrible battering in the effort to break down his testimony. It was a trying ordeal and the witness was worried and nervouse. (sic) Though, in some important details he crossed himself, he stood up to the main facts and the audience were inclined to believe that he was telling the truth. A. W. FELDMAN recalled: I was down to Stevens’ Tuesday morning and saw a lot of people out in front examining something in the road. I said to Fred WALL, “Fred, what’s the excitement?” He said, “Oh, a lot of –––– fools are out examining where Sherm’s horse bled.” He had on a pair of dirty overalls. The next day he had on a pair of new ones—or at least I thought they were new—the were clean. Theordore STREETER recalled—The dirt in the wound on WATERMAN’s temple was dark loam, not coal ashes or cinders. It was not deeply imbedded in the wound as it would likely have been if driven in by a fall from some height, it washed out easily. In one end was gravel about the size of a pea. I had to open the would to get that out. E. B. PHINNEY—I was at the Wyoming House about 10 o’clock on the night of Jan. 8, 1894. Staid (sic) about five minutes. William WATERMAN and WESCOTT (sic) were there. WESTCOTT started out to look for G. W. WATERMAN, while I was there, and had not returned when I left. Fred WALL and another fellow came in while I was there and asked for Tom. They went out again. The lamp in front of Stevens’ was out when I went home. Nina SHOOK—I worked at the Stevens house in January, 1894. Bert PRATT, Alva PRATT and Mr. BUCHANAN were stopping there during court. Fred WALL was about the hotel on the night of the 8th. I noticed him and Pratt going out and in several times. Next day they were all there. I was sweeping in the dining room and hall, next the bar room (sic). They came in between 10 and 11, and I heard them say “If they search us they won’t find anything, not even a jackknife.” He came in several days after, when Mr. STEVENS had discharged him, and wanted some dinner. I gave it to him. While eating he said something about their suspecting him of the murder. I said, “If you know anything about it, why don’t you tell?” He said “I don’t want to hang myself.” He further said “If they hang me I won’t hang alone. I’ll turn state’s evidence, and some of these fellows will have to hang with me.” Up to the time that Fred left I noticed no change in his clothing, didn’t see any blood upon him. I told Mrs. STEVENS about hearing them say what they did about the jackknife soon after it occurred, while we were getting dinner. Did not tell it to anybody else except my mother. About a week after that I was out in the back yard and the boy called me to the barn door, when I saw Fred’s knife on the barn floor behind a post. The boy was sweeping the floor and uncovered it. I took it, knew it was Fred’s knife, and carried it into the house. The attempt to show by Dr. DENISON, on the part of the commonwealth, that the fatal wound on Waterman’s head might have been produced by a coupling pin, such as Mr. IDE described, was objected to by the defense and the objection sustained. Dr. E. H. HILL—The wound on the temple of WATERMAN would not necessarily cause instant death. A person receiving such a would would be instantly unconscious and unable to change his position, in my opinion. The wound could not, in my opinion, have been produced by a coupling pin such as Mr. IDE described. Dr. D. W. STURDEVANT concurred in Dr. HILL’s opinion in the main points. W. S. KUTZ, justice of the peace—Describes the pocketbook found on the body of WATERMAN. J. Wood PIATT—Shown a bundle of manuscript; identifies it as notes of testimony taken by him before coroner’s jury. Refreshes his memory from notes and says that when Fred WALL was asked about the pool of blood said he didn’t know how it came there. W. H. RICHMOND, detective—Live at Pittston. First saw Fred WALL on Nov. 26 last. We went to LaGrange together. Saw Fred first coming into tow in a buggy. A man by the name of JERDEN pointed him out to me. I was made acquainted with him in McGee’s hotel. We went down to WALL’s hotel and they refused leaving him in there. Said they didn’t want him around. Went to Keeler House and the Stevens House and had drinks in each place. Then went to Betts’ livery; hired a horse and started for LaGrange. Don’t know how many drinks we had; I was paying for everything right along. We staid (sic) at LaGrange half and hour and started back to Tunkhannock. I was working up the case—working for the reward. George BROWN sent me here. The defendant was not drunk when we went to LaGrange. After we had driven a short distance I said “Who am I with; I don’t know you, I am looking for a partner and want a man I can trust.” He said he was all right and I could trust him. I told him I wanted to be sure. Told him to hold up his right hand to God and swear, and he did so. Then I told him that I came from Providence, R. I., where I and my partner was robbing a shoemakers, and the shoemaker came in and surprised us and we were obliged to take his life; that I came here with $2,600, which I had up in the bank. I said my partner was still writing to me and I wanted somebody I could trust to help me out. He said he could prove he was all right by Byron AYERS. I asked him what he could prove; and I wanted a partner who had been through the mill. Said he could prove by Byron AYERS that he had been through the mill. I asked him who he had killed and he said: “If they get hold of me they would hang me.” Can’t say if he told me the man’s name or not, but said he was a man who came down to court from Nicholson. We planned to get my money from the bank and I asked him where we should go with it, and he said Canada would be a good place. Witness told of some more unimportant details, and said that he then made the arrest. The court closed with his testimony still unfinished. Richmond Makes Peculiar Admission in the Wall Case. Evidence of the Commonwealth All in at Tunkhannock—Fred Wall on the Witness Stand—His Account of the Evening. Tunkhannock, April 12.—W. H. RICHMOND still on the stand. The greatest part of the conversation with Fred WALL (in which the confession of murder was made) was help while we were going down to LaGrange. It began between the Montrose railroad crossing and the covered bridge. I told him the story of the robbing and killing of the shoemaker at Providence, R. I., after I had asked him to prove himself if I was to take him in a partner. Attorney for defendant: “When you arrested Fred WALL you made information charging him with the murder of WATERMAN, didn’t you? A squabble here ensued between the counsel as to the admission of evidence from a witness who had charged more than one person with the same crime. The judge ruled that there was nothing inconsistent in the information made in this case. Witness: “I had a written statement of the confession made by WALL when I visited HINKLEY’s at Nicholson. Think I left that on the table there along with some other papers, which I forgot. I was drunk. I did take a hired girl from here in town with me up there once when I went. I am a married man. She wasn’t a detective. (These in answer to cross-examination.) I brought Bert PRATT here about 12 o’clock at night. I or the turnkey took him down town the next day. I did not offer him a part of the reward if he would put it onto Fred WALL. I told him that if he had anything to do with the murder and would turn state’s evidence I thought it go easier with him (sic). I saw Mrs. BIDLEMAN at Dr. DENISON’s I didn’t say anything about dropping the proceedings if she would pay me a certain sum of money and go to California. I told her I didn’t have any hard feelings toward them, but I thought they looked down on me. There might have been something said about money. I wanted to see what they would say. Thought they all looked down on me. I did see Dr. BIDLEMAN at the Stevens House. Heard he wanted to see me, and I went there and called him out, because I wantd (sic) to know what he wanted of me. He wanted to settle. Did say I would meet him next day, because there was something said about making marks to see what I would take to stop proceedings. Did not make a proposition that if he would pay me a certain sum I would go to California to see an aunt. There was a certain party came to me and wanted to know what I would take to go away. Said Dr. BIDLEMAN wanted to know. Said he would mark and I could mark. I made some figured in a joke and handed them to him. The man was Mr. DEUBLER (sic), engineer on the Montrose road. The man who sent him was Dr. AVERY. He didn’t want to come himself. Don’t know if Dr. BIDLEMAN wanted them to come. I said something its being a state’s prison job, but suggested how it might be done if they wanted it done. Think I told Mr. DUEBLER (sic) that I could get $1,300 for convicting Wall—$500 from the county, $500 from the family, and $300 from a sister of Waterman; might have said so, don’t remember. Didn’t say anything about leaving the country if they would pay me money. William WATERMAN recalled—Counsel for defendant—You spoke in your former testimony of C. (sic) W. WATERMAN offering you some money near the coal office. Was Bert PRATT or Fred WALL present? Answer—I didn’t see them. I saw Dr. BIDLEMAN examine my bother’s body after it was found by the coal chutes. I. E. WESTCOTT recalled and testified to the examination by Dr. BIDLEMAN. Thought he took hold of the vest and pulled it back, but didn’t know as he unbuttoned it. Thomas M. HARDING— Just south of the coal chutes are two railroad tracks, and Montrose and Lehigh Valley tracks. These tracks are quite a public thoroughfare, a short cut to the depot. Wagons cannot go that way. C. N. CRAWFORD—There is a sort of undertie on the embankment of the trestling, running out near the edge of the wall. On the top of the wall are stones with broken irregular edges. It is 7 feet 11 inches from the ground up to the iron rails at a point where the body lay. O. S. MILLS recalled—There is a stick of timber sticking out on top of the wall or filling, but it is nearly embedded in the ground. James W. PIATT opened for the defense by addressing the jury. He endeavored to discount the impression made by the commonwealth that a murder had been committed, and was not sparing in his denunciation of some of the witnesses. The theory of the defense is that WATERMAN accidentally fell off the embankment and was killed. Dr. B. E. BIDLEMAN—Fred WALL is my brother-in-law. Was called out on the night of January 8, 1894, to go over to Gearhart’s coal chutes, where I found the body of Wash WATERMAN. (Describes position of body.) Saw wound on temple, felt of pulse and found it still, then opened eye and felt of the covering of the pupil to see if there was any sensitiveness; found none; then put my hand down inside his vest to see if they heart was beating; it was not, and after feeling to see if there was any warmth in the body, told Mr. PRATT and William WATERMAN, who were standing by, that he was dead. (The description of the autopsy agreed with that of former witnesses.) In my opinion the wound on the temple could have been produced by a fall from the trestling. I was called before the coroner’s jury the next day after the finding of the body. I didn’t know then that they suspected Fred. I heard of it shortly after. Saw Fred every day, right along. He wore the same clothes that he had worn. My wife told him that was dirty and had better clean himself up a little and put on some clean clothes. I said, “Fred, they suspicion you and it wouldn’t look well for you to go and change your clothes now.” He took my advice for once and wore the same clothes right along. Refering (sic) to the meeting with RICHMOND at the Stevens house, the witness said: “He called me into the back room and said he wanted to see me. Began talking something about a close mouth catches no flies,” nodding and winking at the same time. I said “What do you want? Do you want me to buy you?” He said, “Well, if we could think alike I might go to California and see an aunt and forget to come back.” I told him if he wanted me to buy him he must fix a price. He went on to say that this thing had cost him about $200, and when this was done it was all gone. He asked me to send a man around next morning and he would make and the man might mark, and they would fix a price that way. I told him I would consider it. I want to say, though, that I didn’t send the man around. The question was asked the witness if he did not at the coroner’s inquest state that it was his opinion that the fatal wound was produced by a blunt instrument giving a downward blow. He endeavored to qualify it by adding “or a fall,” but the commonwealth pinned him down to the original statement. He thought not, and persisted that the question was put to him in different form at that time. In the cross-examination the witness was subjected to a rapid fire of questions, many of which embarrassed him and he showed a determination to evade. According to his own statements he knew nothing of the tragedy until late next forenoon; didn’t see the crowd in the morning when they were examining the trail of blood in front of the house; didn’t go to see the dead body and couldn’t say whether he went over to see the pool of blood at the coal chutes that day or the next. He steadfastly evaded the question as to whether he did not go to bed within fifteen minutes after hearing WESTCOTT say, while at the Wyoming house, that he was going out to hunt for a man. Mrs. S. D. STEVENS called. She testified that the street lamp was put out on about 11.20 by Fred WALL. Tunkhannock, April 14.—C. M. BARLOW was the first witness examined in the Wall trial yesterday. BARLOW testified to seeing hair that looked like a piece of cow’s tail lying near the pool of blood in front of the Stevens House the morning after the dead of WATERMAN, and that next morning if was lying upon the pool of blood. The inference was that its presence there was merely accidental. This testimony tended to neutralize the impression made by S. J. KEATING’s statement, which was to the effect that the hair had been purposely put into the blood to bear out the story of the horse calking itself. Mrs. BIDLEMAN, related the meeting between herself and RICHMOND at Dr. DENISON’s, in which he offered for $200 to tear up the written statement of Fred’s alleged confession, drop the whole proceedings and clear out and leave the country. The witness asked him if he thought she was fool enough to think that that was all that was necessary to stop the proceedings, and told him that he could not get anything out of her. Witness further testified to interviewing Nina SHOOK at Noxen, Dec. 1, when Nina related the alleged conversation she overheard between PRATT and WESTCOTT, during which PRATT offered WESTCOTT money to swear differently in court than he intended to and that Nina declared to her that that was all she knew about the matter. She also expressed a willingness to swear before Will SECOR that it was all she knew. Witness also visited Mrs. KEATING on the same day, and Mrs. KEATING related what Fred had said to her at different times about his troubles and claimed that her story then did not at all agree with her (Mrs. KEATING’s) testimony on the stand, although she averred to witness that it was all she knew. Mrs. BIDLEMAN is a sister of Fred WALL. Cora CARPENTER, a domestic in Dr. BIDLEMAN’s family, corroborated Mrs. BIDLEMAN’s testimony. Dr. DENISON testified that RICHMOND told him on the night of Dec. 31, 1894, that he would go to California and forget to come back if a purse of $200 was raised for him. E. V. LOTT saw Fred WALL and Bert PRATT at the Warren Street hotel between 10 and 11 o’clock on the night of Jan. 8. He also saw the body of WATERMAN before it was removed from where it was found. Examined grand and found a loose stone, which fitted into a niche in the way. The clothes on the body were all in perfect order, except his pants were slightly drawn up over the boots. Thomas MONSEY testified that RICHMOND was apparently drunk on the day he arrested WALL. Mrs. George HINKLEY: “My husband keeps the Nicholson House at Nicholson. Saw RICHMOND at our house when he arrested WESTCOTT. He was there once before and had a young lady with him. He told me that she one (sic) of the best detectives in New York city. Jerome CORNELL told me afterward that she was a young lady from Tunkhannock.” Witness related the arrest of WESTCOTT and said that RICHMOND told him he had better turn state’s evidence. Several other witnesses called to corroborate former testimony. W. E. CARPENTER testified as to the location of the street lamps in the vicinity of the tragedy and that they were all lighted on the night in question. J. Wood PIATT recalled and stated that RICHMOND was drunk when he arrested WALL. His reason for thinking so was because his face was flushed. A. M. EASTMAN, justice of the peace, before whom RICHMOND made the information on which WALL was committed, concurred in the opinion. Bert PRATT, a prisoner at the jail on charge of being an accomplice in the murder of WATERMAN, called: “Am a resident of Nicholson township. Was at January court last year, had a suit against Henry WATERMAN.” Witness relates events leading up to the time the alleged murder occurred, much in detail as Fred WALL had done, getting himself safely to bed at the Stevens house in due time. He did not fix a specific time at which the latter event occurred however. He also related the details of his arrest. On cross-examination he denied the alleged offer of money to WESCOTT (sic) to change his testimony in the case in which he, the witness, was interested. He fixed the time that he and WALL got back to the Stevens house, after their tour about town in search of oysters and drinks as between 10 and 11 o’clock. The balance of the afternoon was sent (sic) in examining a cloud of witnesses, chiefly in rebuttal of former testimony and bearing upon the veracity of the witnesses in chief upon both sides. No new facts of any importance were brought to light, and judge, jury, counsel and spectators drew a sigh of relief when it was announced shortly after 5 o’clock that the testimony was all in. The court was then adjourned till Monday afternoon. The testimony in the WATERMAN murder case being all in, the attorneys will begin their pleas immediately upon the convening of court today. The case will probably not get into the jury’s hands before tomorrow. Judge DUNHAM charged the jury in the WALL case on Monday, and they went out about 7.45. Sometimes before midnight they agreed upon an acquittal, sealed up their verdict and went to bed at the hotel. The verdict was opened in court yesterday morning, and after being announced the prisoner was allowed to walk out of the court room a free man. As there was no more convincing evidence against Bert PRATT than against WALL, it was agreed to dismiss him also. His attorneys would not allow a nolle pros to be entered, however, but insisted that a jury be drawn and a verdict of not guilty regularly entered so that the case might not be taken up against him at some future time. This was done as a mere matter of form, and he was also allowed to go. Thus ends one of the longest and most expensive trials that ever took place in the Wyoming county courts. The jury in the Wall murder case, with their tipstaves, presented to Newman FITCH, proprietor of the Keeler house, a handsome rocker, as a token of their appreciation of the courtesies extended to them during their stay at the house. The presentation was made by D. A. KNUPPENSBURG, and gracefully received by the genial landlord. The rumor that PRATT had confessed to the murder of Waterman since his acquittal was a fake yarn started by some of the boys, who enjoy romancing occasionally to measure the credulity of the people. Another warrant was issued for W. H. RICHMOND, the alleged detective, yesterday, on complaint of Peter MCGEE, landlord at the Warren Street hotel. RICHMOND went to District Attorney FREAR Tuesday and obtained a statement of his fee as witness in the WALL case, and then proceeded to draw his pay from the country. The commissioners did not ask for the statement, for they already had it on file. RICHMOND then went to Mr. MCGEE and showed the statement, offering to sell the account at a less (sic) figure. His offer was accepted, and he pocketed the money and left town on the next train. Constable PIATT went to Pittston yesterday noon, wih (sic) a warrant, in search of him. The quasi detective has been traveling a rocky road since making his debut in Tunkhannock, this being but one of many scrapes of various kinds he has got into. A man who gravitates as readily to the wrong end of his business as he does had evidently mistaken his calling. Constable R. M. PIATT returned from Pittston yesterday without RICHMOND, the detective, who is wanted for defrauding Peter MCGEE. If he is in that vicinity he is laying low.